Before I talk about Naomi Wolf, I’m going to talk about my love for The Feminine Mystique. What I love about this book, and what sets it apart, in my opinion, from other 1950s and 1960s polemics, is that it has an extremely simple point: Women can’t achieve emotional fulfillment unless they enter the workplace and get skilled, professional jobs. Nowadays, people ignore that, because there’s something unsavory about it. For one thing, it’s classist. Friedan appears, at many points, to be saying that low-skilled and unskilled laborers can’t lead contented lives. For another, it’s demeaning to housewives. Friedan doesn’t say, “Oh, you should stay at home if you want to.” No, on the contrary, the ‘wanting to stay at home’ was the problem. Her book was about critiquing the entire industry devoted to convincing women that emotional fulfillment lay in the arts of hearth, home, and child-rearing. But what makes the book effective is the fact that it’s so normative. She’s saying something bold. Something you can hold onto. That thing may not have resonated with many people who read it, but for some people it did. For some people, Friedan’s book was the secret truth that they’d been hiding from or struggling to articulate. Now I am not particularly far into Naomi Wolf’s book, but I am liking it for the same reason. It’s a book that doesn’t compromise. 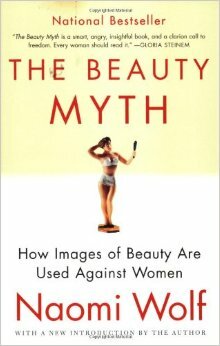 Naomi Wolf isn’t saying, “Oh, if you’re unhappy because you feel bad about your appearance, then you need to be able to…” No. She is critiquing the concept of beauty itself, and its place in society. The whole first chapter is about the way that beauty standards are used to oppress women in the workplace, and the ways that women accept that oppression. It’s pretty electrifying.